There seems to be missing parts. Where is the international tv revenue for the Bundesliga? I guess the international TV right don't have been sold yet. But the league need to sell the international TV rights better in the future. I hope it will increase a lot too. What don't you understand on this table ? Bundesliga will have 4,600,000,000 € domestic TV right on the next 4 years without including international TV rights ... while EPL will have 10,500,000,000 € TV rights (including international rights) on the next 3 years. The Bundesliga domestic TV right amount between 2013/17 and 2017/21 will increase of 84% ... while the EPL domestical TV rights between 2013/16 and 2016/19 will increase of 50 to 57%. And that they hadnt included the new international deals from the Bundesliga. But what I find surprising is that La Liga is apparently getting even more than what was presented less than a year ago. bbenno wrote: And that they hadnt included the new international deals from the Bundesliga. Correct me if I'm wrong but weren't the international rights sold around 2014 or 2015? I don't think there's a new deal yet, although it's probably almost time for a new one. I'm asking because I can't seem to find any articles about it, but as far as I know last year's deal was domestic. But I think there have been numerous smaller deals struck for e.g. the European market, Asia and the Middle-East and I also think they're in the process of negotiating for the Chinese market, but that might drag on. Almost a €30M player + his wages for 5 years ... every year. Who cares about the domestic TV deals? What's interesting is the total TV deals, i.e. 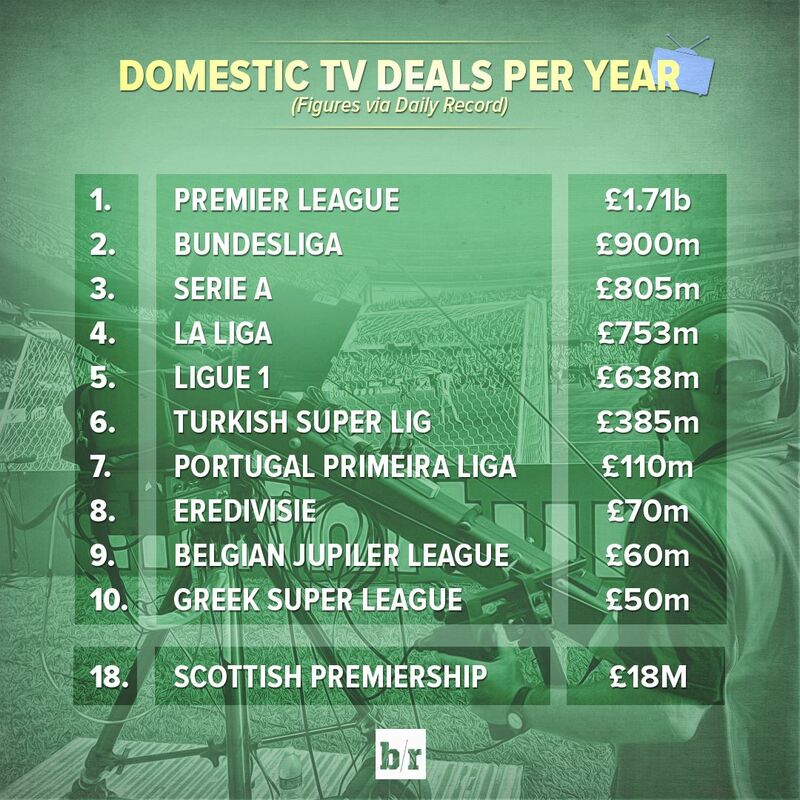 including overseas rights, where the Bundesliga gets a fraction of the Premier League. MUTU wrote: Who cares about the domestic TV deals? What's interesting is the total TV deals, i.e. including overseas rights, where the Bundesliga gets a fraction of the Premier League. Exactly! And that is why La Liga is also still ahead of the Bundesliga, at least for now, until we get a major increase in the international rights department(e.g. USA, China etc. )...however that should be under way in 2017 or 2018.